« Large, Medium and Small. Three Sizes of Energiewende. Today we take airbags for granted when we buy a car. Most cars have now several airbags for to protect driver and passengers from frontal as well side collisions. Some cars also have airbag protection against rear end collisions. National Highway Traffic Safety Administration (NHTSA) published in January 2009 a study confirming the significance of the airbags for automotive safety. 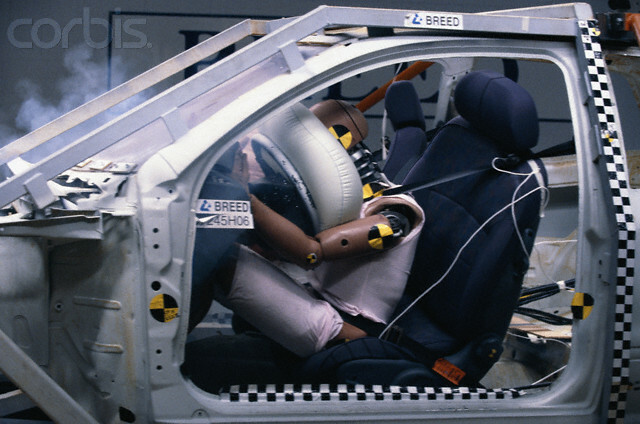 Since the introduction of airbags up to the time of the study they have saved 28 244 lives. It has been a huge accomplishment to develop this sophisticated technology and make it a standard in cars. Unfortunately the recent massive recall involving over 30 million cars by Takata Corporation illustrates that airbags are not yet the ultimate zero defect product one would like it to be. The invention of an airbag goes back to 1951, when Walter Linderer and John W. Hetrick independently of each other filed patents in Germany and USA respectively. In both cases the patents were issued in 1953. However, the patents had expired when the first cars with airbags reached the market in the early 70s. It would take another 15 years until airbags commercially took off. Safety Cushion Assembly for Automotive Vehicles. US Patent 2649311 issued August 18 1953. 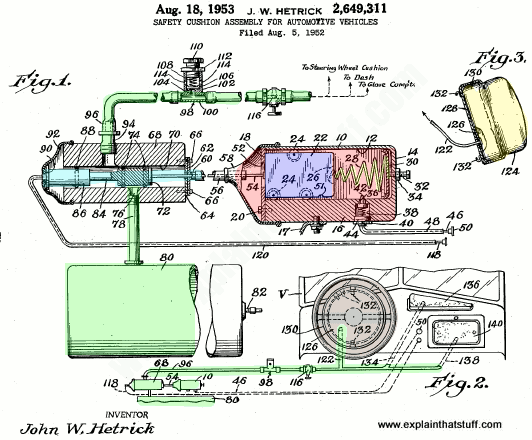 The original patents were great concepts but the technology was not available to turn it into products. An airbag system has about 30 milliseconds to complete the total sequence from detecting a crash, to trigger the inflation of the airbag, which has to start deflate when the car occupant’s head hits into it! Linderer’s airbag was based on compressed air, but when Ford and General Motors (GM) in the late 1950s carried out feasibility studies they identified that the airbag could not be inflated fast enough. Further there were no suitable sensors and electronics/controls available to correctly trigger the system. During the 1960s step by step the key components for a functioning airbag system started to emerge in the U.S., Germany and Japan. The key breakthrough was the development of the inflator, a gas generator to inflate the airbag. The inflator uses sodium azide as the key ingredient of the solid “rocket-engine” like fuel. Probably the first airbag system was the one Eaton Yale and Towne Inc. (later Eaton) announced in the mid-1960s. Ford teamed up with Eaton and planned to offer airbags in some of 1971 car models, but later cancelled the plans due serious risks with the system. Meanwhile GM had started its own air bag development and became 1973 the leader by installing airbag systems in 1000 Chevrolet Impalas.as a large field trial. The first commercial car with an airbag system was the Oldsmobile in 1974. GM tooled up to produce 100 000 systems a year, but lack of customer interest resulted GM to stop the program in 1977. During the period 1974 – 1976 only 10 321 cars with airbags were sold. It would take 4 years until another car company would again offer airbags as options to car buyers. In December 1980 Daimler Benz (DB) introduced driver airbag option for its model S in Europe. Gradually DB expanded the airbag option to more car models as well as for both driver and passenger side. In 1984 started to offer the airbag option for the US market. This time the customer response was much better. Interestingly like the Tesla model S today the Mercedes model S was an upper end car. It had the extra safety appeal to customers, for whom cost was not an issue. DB had started its airbag development in the late 60s and systematically continued through the 70s. Together with partners like Thiokol (later Morton, now Autoliv) for the inflators and Bosch for sensors and electronics/control they engineered the airbag systems to a new level. By 1984 it was technically ready for the mass market. Still it would take 5 more years until the big break-through. Airbag systems have to be designed to specifics of each car. Advanced mathematical modeling and extensive crash tests are integral parts of the engineering. An airbag system was substantially more expensive than an automatic seat belt system and it looked like the automatic seatbelts would be the dominant alternative. In Europe and Japan the skepticism against airbags was significant, since mandatory seatbelt laws and high usage of the seatbelts reduced the perceived need for airbags. Airbags would probably remained an option for the upper end cars, if not Lee Iacocca, then chairman of Chrysler, had made a U-turn in his previous opposition against airbags and instead in early 1989 announced the decision to install driver side airbags in all Chrysler passenger cars by model year 1990. It triggered the competitors to follow. With costs coming down and with the convenience of an invisible system for additional safety airbags got the mainstream customers’ acceptance and demand. Thus it had taken some 40 years until airbags became a disruptive technology. The “shale gas revolution” is of disruptive proportions but also here it was not something that happened over night. In this case it took over three decades of dedicated development and eventually three technologies to come together: horizontal drilling, hydraulic fracturing and three dimensional (3D) mapping. The drivers were not consumers or legislators, but wildcatters. Gregory Zuckerman in his book The Frackers (2014) tells the fascinating story. 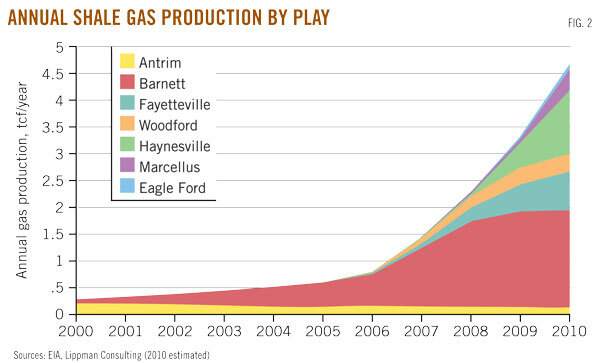 2006 represents the tipping point for the “shale gas revolution”. Natural gas was first extracted in Fredonia, New York, in the 1820s, decades before the first producing oil well 1861 in Titusville, Pennsylvania. Fracturing was early used in oil production and from 1940s also used for natural gas extraction. True horizontal drilling was first deployed in 1939, in Morgan County, Ohio. So why would it take about 50 years for the” shale gas revolution” to materialize? First of all there was no huge demand for natural gas. Secondly conventional vertical drilling was the most cost efficient way to explore and produce. It all started to change in the 1970s due to growing demand for natural gas and decline in natural gas production. The industry started to look at unconventional resources such as coalbed methane deposits, “tight sands” natural gas and shale gas. The shale formations containing gas have insufficient permeability for the gas to flow, making it very challenging to economically drill and extract the gas. The technology available in the early 1970s was just not ready to the challenge. Thanks to the progress and good cooperation between the government researchers and natural gas industry, the public-private partnership was in 1979 formalized in DOE’s Commercialization Plan for Recovery of Natural Gas from Unconventional Sources. In retrospect it may be one of the best examples of how public and private interests can work together. A major breakthrough for horizontal drilling came with the steerable downhole motor, basically an engine behind the drill bit, which could be controlled from the surface. Coupled with so called MWD technology (“measurement while drilling”) speed of drilling, accuracy and maybe most of all the length of the borehole was much improved. Linked to the MWD is the 3D geologic mapping technology, for which Sandia National Laboratories did pioneering work, originally for applications in coal mines. In 1986 in Wayne County, West Virginia, a joint DOE-private venture drilled the first successful multi-fracture horizontal well. It is also important to notice that many of technical developments towards making shale gas extraction economical benefitted significantly from all the development and progress in “conventional” oil exploration and production during the 70s and 80s. The developments of the Alaska’s North Slope, the North Sea and other demanding locations/resources were anything but trivial. It would not been possible without the strong development of advanced technologies ranging from the (artificial) diamond –studded drill bits, to directional drilling, to high pressure fracturing, to 3D mapping, etc. Nevertheless, the shale gas revolution may not have happened if not for one person’s belief and tenacity, George Mitchell, a veteran of the Texas natural gas industry. He looked for new natural gas resources to compensate for his depleting conventional natural gas wells. In 1991 his company, Mitchell Energy, partnered with DOE and Gas Research Institute (GRI) to develop tools to effectively fracture formations in the Barnett shale, near Fort Worth, Texas. Long story short in 1991 Mitchell Energy did its first successful horizontal well in the Barnett shale and in 1996 they achieved the first commercial shale gas extraction. However, the production was not enough to make it take off. The wells tended to deplete fast and to keep it up new wells needed to be drilled. The final break-through came in 1997 with Nicholas Steinsberger, an engineer at Mitchell Energy, who worked with developing the fracking fluids. The conventional fracking fluids with liquids and gel were costly and not very efficient. According to Gregory Zuckerman in his book The Frackers while supervising a well Steinsberger noticed that a contractor incorrectly pumped a substance that was more liquid than the regular fluid mix. To his surprise he noticed that the well-produced better than expected. A couple of weeks later Steinsberger learnt from a colleague, Mike Mayerhofer, whose company Union Pacific Resources (now part of Anadarko Petroleum Corporation) was drilling in a different rock formation using a mix composed mainly of water with good results. Steinsberger concluded it would be worthwhile to try using more water for the fracking of the Barnett shales. Ridiculed by some but ultimately supported by George Mitchell he and his team continued to refine the mix and got it applied to more wells. In late 1997 Steinsberger started to see that contrary to other wells “his wells” kept production up. In 1998 one well called S.H Griffin No. 3 after 90 days produced much more than any other well. 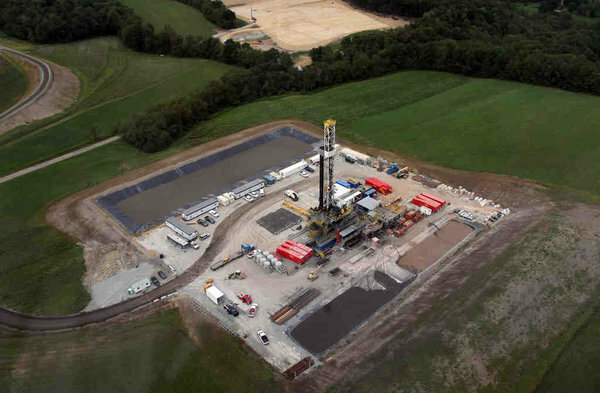 A Marcellus Shale drilling site near Latrobe, PA. Picture by Lawrence Kesterman, staff photographer of Philly.Com. The “discovery” came in the very last minute for Mitchell Energy. 1998 and 1999 were very tough times for the industry and George Mitchell tried in vain to sell his company. But now the technologies worked. By 2001 production had increased 250 % in two years. Devon Energy took notice and in 2001 bought Mitchell Energy for $3.1 billion. Devon and other companies continued to expand the Barnett field and by 2013 the output from the Barnett shale represented 6 % of the nation’s energy supply. The “shale gas revolution” had started, spread to more shale gas formations like the Haynesville and Marcellus shales and has given United States a competitive advantage and significantly contributed to the nation’s energy independence. In conclusion both the airbag case and the shale gas case go to show that so called disruptive technologies take time to happen and that it is not only about technology.